Terps pitchers Kabir Chugh (left) and Andrew Wise (right) combined to shutout the Eagles on opening day. Photos by Josh Belanger. 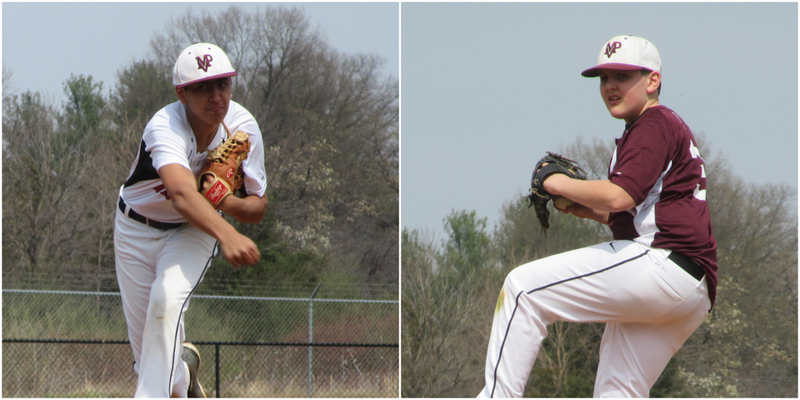 Kabir Chugh struck out seven and allowed just one hit over four scoreless innings while driving in one of the two deciding runs for the MVP Terps Select 14u in a 2-0 opening day win over the Loudoun South Eagles 14u yesterday at Sully Highlands Park. Chugh worked quickly through the Eagles’ lineup, walking just one batter while the only hit came in the form of a first inning double. The right-hander used his breaking pitch early in counts to set up an elevated fastball that only improved as the game progressed as he struck out four of the last six batters he faced. “It felt good to get back out and my team made a lot of good defensively plays,” Chugh said. Terps coach Galvin Morris knew his starting pitcher had more in the tank, but turned to reliever Andrew Wise in the fifth inning siding on the err of caution on the first game of the season. Wise was just as effective, allowing just two hits while striking out four and walking none over the final three frames. “It’s early and we have pitch counts,” Morris said. “Kabir got to his pitch count, which was at 55, and we went to the next pitcher. It’s a process and the next outing we will hope to add five more pitches to it. Andrew came in a did a good job in relief. Eagles starting pitcher Brendan Desjardins matched with three scoreless innings of his own, but was relieved by Luke Proehl with one out in the fourth after Jack Balderson reached on a base hit. Desjardins was later charged for the run after Balderson came around to score on a pass ball to give the Terps a 1-0 lead. Chugh’s day on the mound was complete after four innings, however he was not done at the plate. In the seventh, he provided an insurance run with an RBI double to left field with his second hit of the game. “Coach told me to look for the pitches that I want to hit and I saw a pitch that I liked and put a good swing on it,” Chugh said. Chugh, Balderson and three-hole hitter Reese Kelly went a combined 6-for-9 and scored both runs for the Terps. The Terps swept both games of the doubleheader with a 8-3 victory in the second game. The Terps will be in action again on Tuesday against the Mizuno Outlaws Gray while the Eagles will play in a doubleheader against the YBA Hustle on Saturday.